On the occasion of the opening of the show Dresden 5774 by Elke R. Steiner, a reading and discussion on the theme of ›Normal Jewish?‹ will take place with the author Viola Roggenkamp and the linguist Dr. des. 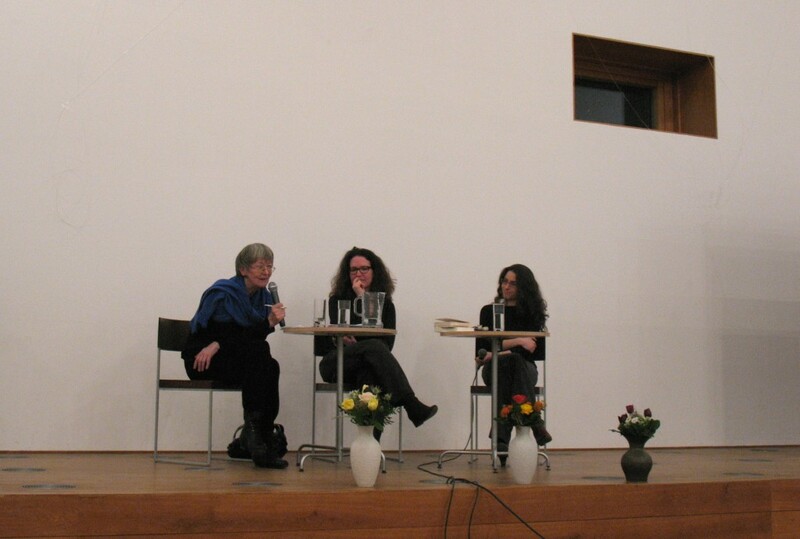 Galina Putjata portrayed by Elke R. Steiner, moderated by Valentina Marcenaro (Jewish Community of Dresden). The Hamburg-based author Viola Roggenkamp reads from her 2009 novel Die Frau im Turm, in which she combines the exile fate of the famous Countess Cosel with the life story of a young Jewish woman searching for her father in Dresden and Berlin during the period after German reunification. With the Jewish father and German communist during the GDR era, whom the daughter finds during the course of the novel and who now works as a concierge in the Taschenbergpalais, the novel gains a further, contradictory facet of the life and the entanglements of German-German-Jewish and also Israeli history (Die Frau im Turm, novel, S. Fischer Verlag, Frankfurt am Main 2009). Viola Roggenkamp, born in 1948, has published several important novels on Jewish identity in Germany, including Familienleben. Ein Roman (2004), Tochter und Vater (2011) and Erika Mann. Eine jüdische Tochter (2005). Normal Jewish ? – Is that possible in Germany? Even in the third generation after the Shoah the patterns of coping with the past between inhibition, compensation and trauma are still present in Germany—and yet a very ‘normal’ everyday life, a family life exists. At the same time, there are numerous individual convictions and lifestyles of Jewishness. How is a person ‘Jewish’ in which situation? Do all individuals even want to talk about Jewish identity? How do people in one’s social surroundings react when they find out that someone is Jewish? The discussion brings together Viola Roggenkamp, as a representative of the second generation of Jewish identity in Germany, with Galina Putjata and Valentina Marcenaro, as representatives of the third generation, each with their own family stories and descents. The discussion was proposed by Valentina Marcenaro, the co-initiator of the project Vot ken you mach?, as an opportunity to express different experiences, the longing for normality and a lively form of Jewish identity beyond the discourses of remembrance.